A shed full of colour. A weekend of fun. As I posted earlier today we had the Art Trail happening over the weekend. It is a biennial event where members of CRAG (Channel Regional Arts Group) get together and open their studios for 3 days to showcase, demonstrate and sell their craft. We have painters, glass workers, metal sculpturers, mixed media, quilters and beaders amongst others. There are usually a couple of Exhibitions in local halls along the way and maps are handed out at each location so you can start wherever you want to. It has been around for 6 years now, this one was the third and my first as part of a studio. Two years ago while still in Mt Isa my mum had several pieces of my jewellery for sale. For that to happen I had to be a member so I joined up and two years later have been part of several CRAG exhibitions along the way. Mum and I along with respective husbands spent several days cleaning and tidying the shed ready for the big weekend. My mum has her wet studio here full-time, but only takes up a small part of the space. She also has just opened up a retail shop in one corner selling all sorts of wonderful materials, book and assorted accessories for quilting, bag making and any other sewing you may like to do. Once we were both set up and open for business on the Friday (it took me a whole day to do my display, Wednesday morning I had to hang the cloth and banner, move and cover the piano, sweep (numerous times) and bring my tables across while Thursday afternoon was spent setting up. You have to get it just right, with lots of tweaking involved. Once done, I walked out of the shed, turned around and came back in. I wanted to see what it looked like from a customer’s point of view. What they would see as they came in. What a feast for the eyes. It was huge. There is so much space and with quilts on the walls, stands full of scarves, bright jewellery on white table cloths it was amazing. There was so much colour everywhere. Bright and cheerful and just a wonderland to walk into. I had my own little corner – well, kind of, in between two doorways, but I fit perfectly – and I made it my own bright boudoir with sheaths of material on the wall (the pink could have been bigger, but we can work on that for next time) and tables laden with bright jewellery, bags and accessories, an overflowing jewellery box, a veritable Aladdin’s cave of goodies. Sales wise I had a profitable weekend with many goodies going off to new homes with happy owners and I talked to lots of people about lots of things, plus I made some extra earrings and bracelets. Always needed. Purely from a marketing point of view, it would be great to have something like this on a smaller scale bi-annually?? (every 6 months) but the organisation would be horrendous and no one wants to go there. So without further ado and inane chatter I will leave you with a (large, but I love so many of the pictures) slide show of pictures (from both myself and hubby) of Marcato Designs and Quilts to Dye for. I apologise if there are some repeats of pictures I posted the other day. 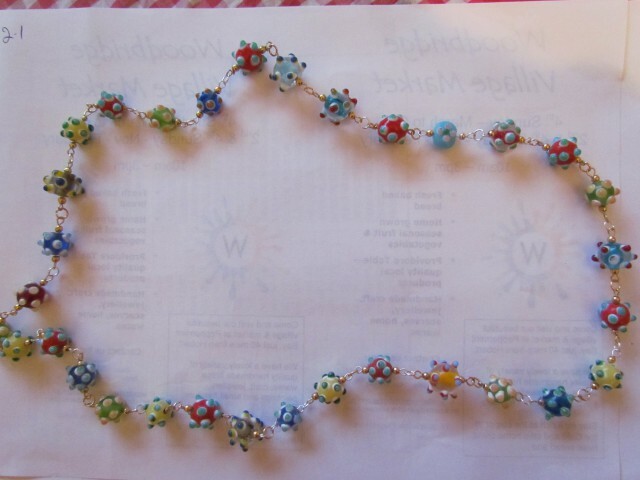 This entry was posted in Beading, Craft Shows & Markets and tagged art, Art trail, bags, Beads, colour, craft, glass, jewelery, quilts, rainbow, sculptures, shed. Bookmark the permalink. Oops, sorry. Not sure I can fix it in a slide show. Maybe try again on it’s own.